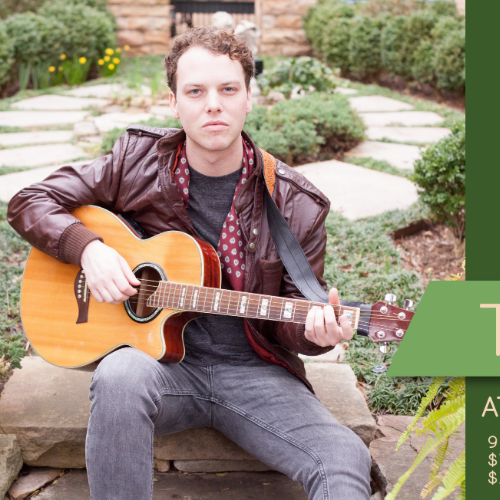 Join South on Main for an evening of folk music with Tim Higgins, presented by South Main Creative. Concert begins tonight (April 13) at 9 pm. Purchase advance tickets for $7 or pay a $10 cover at the door. Tickets do not guarantee you a seat. To reserve a table, please call (501) 244-9660. You must purchase tickets in order to confirm your reservation for the concert. His teenage and college years in Alabama lead to the formation of Bible Study, a collective of songwriters including Higgins, Emily Dozier-Ezell, and Kori Hensell. Their self-described “convoluted folk” genre garnered much attention in West Alabama, including performances at the Kentuck Folk Art Museum and the historic Bama Theatre. In 2014, Bible Study released their first record, Guilt Trip, recorded at WouldYou Studios in Baton Rouge, Louisiana, under the direction of England in 1819’s Andrew Callaway. This entry was posted in Music and tagged South Main Creative, South on Main, Tim Higgins by Scott. Bookmark the permalink.